The Matica Srpska Library has an exceptionally valuable collection of old and rare books, which had begun to accumulate since the day the Library was founded. During its long existence, this collection was expanded with special care. 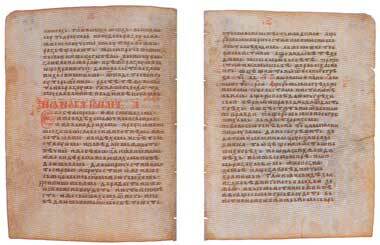 The manuscript collection includes 671 copies, of which 487 are Cyrillic scripts. 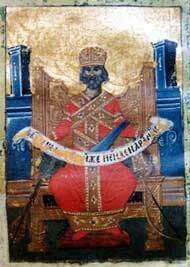 The oldest manuscript is Maticin apostol (The Apostlos of Matica Srpska) written on parchment in the 13th century. It is the oldest preserved unabridged apostle in Serbian edition. Also, there are two manuscript fragments on parchment, in Serbian edition, from the 13th century - Iriski odlomak apostolskih i jevandjeljskih ctenija (Irig's Fragment of Apostle and Gospel Readings) and Bjelopoljski odlomak izbornog jevandjelja i apostola (Bjelopolje Fragment of Selected Gospels and Apostles). There are two parchment manuscripts from the 14th century - Beckerecki tipik (Beckerek Rulebook) and a fragment from Cetvorojevandjelja (Tetra-Evangeliary). Psaltir Gavrila Trojicanina (Psalter of Gavrilo Trojicanin) is one of the best-written and illuminated books in the Library. It was copied in the monastery Sveta Trojica (The Holy Trinity) near Pljevlja in 1643. Another well-written and ornamented manuscript is called Stihologija (Stichologion) and it was copied at the beginning of the 18th century in Szentendre by Kiprijan Racanin, famous copyist of "Raca School". 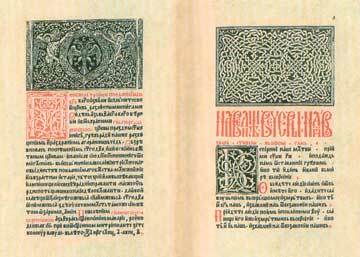 The Matica Srpska Library has 16 incunables - books printed at the end of the 15th century. Among them is Oktoih prvoglasnik (Octoechos) of Djurdje Crnojevic printed in 1493/94. 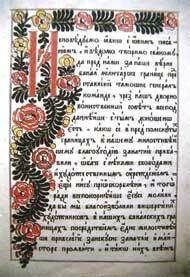 As the oldest Cyrillic Southern Slav book, it was printed in Cetinje, Montenegro. There are very valuable books from the 16th and the 17th century, written in various languages, 38 of which are elsevier type books. 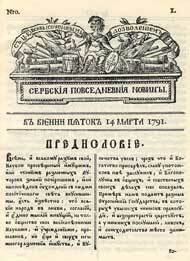 There are 172 books from this period printed in Cyrillic scripts, 144 of which are Serbian. Based on to the number of Serbian books from the period between the 15th and the 17th century, the Matica Srpska Library is the richest one in the world. The Library has the biggest collection of Serbian books, from the 18th century (523 books including 19 menologies); the biggest collection of 19th century Serbian books (about 5,500) and the richest collection of Serbian periodicals from the 18th and the first half of the 19th century (160 titles with 2,190 volumes). The periodicals include among the others: Orfelin's Slaveno-serbskij magazin, the first Serbian journal published in 1768, complete volumes of the first Serbian newspaper published in Wien by brothers Markides Puljo in 1791-1792, complete volumes of the second Serbian newspaper, published also in Wien by Stefan Novakovic in 1792-1794, all issues of Letopis Matice srpske, the oldest Serbian and South Slav literary journal, published from 1824 to the present day, as well as other journals and newspapers. 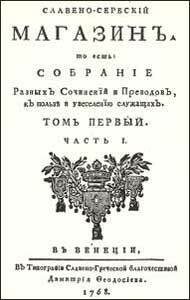 The Library has valuable books in foreign languages, also from the 18th and the 19th century, among which the collection of works in Hungarian and Russian are of special significance. The Matica Srpska Library has arranged the library of the oldest Serbian Secondary School in Sremski Karlovci into a museum-type library, and the arrangements for the Backa Eparchy library in Novi Sad are in progress. Together with the National Library of Serbia, the Matica Srpska Library is arranging the Szentendre's and the Chilandar's Serbian treasuries. The collection of rare books includes books with dedications, signatures and notes of significant persons in history, science and culture, as well as books with seals, books of special technical and artistic value, books printed in a small number of copies and illegal and war periodical editions. 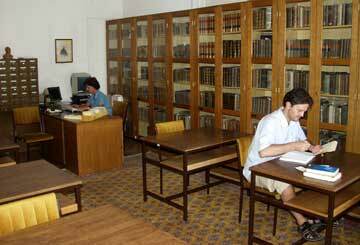 3) Catalogue of Legacies in the Matica Srpska Library (started in 1995). Old and rare books in the Library are stored in a special store-room. Their restoration, conservation, manual binding and microfilming are regulated by an established programme, the Programme for the Preservation of Old and Rare Publications. Old and rare books and microfilms are available to readers only in a special reading-room for rarities. Sets of books, personal libraries and libraries of different institutions and societies, which number about 100,000 books, have special cultural, historical and museum value, and are in possession of the Matica Srpska Library. 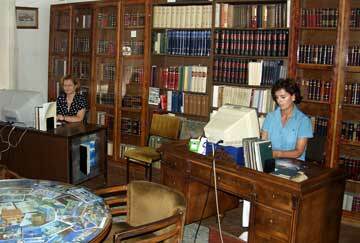 The library of Bishop Platon Atanackovic is the oldest personal library and it was received in 1841. Today it contains 341 books. The most valuable one is the personal library of Sava Tekelija, one of the greatest endowers and donators of the Serbian people with 1,984 books in 15 languages. In reconstructed library of Tekelianum there are 7,104 books in various languages. The Matica Srpska Library also has special sets of books belonging to personal libraries of Djoka Mijatovic, Avram Djukic, Aleksandar Sandic, Jovan Jovanovic Zmaj, Tihomir Ostojic, Petar Popadic, Vasa Stajic, Stevan Josifovic, Mita and Predrag Klicin, Radomir Radujkov, Ivan Subotic, Stojan Subotin, Mirko and Ruza Cvetkov, the Aleksijevic family, Svetozar Matic, Radoslav Mitrovic, Lazar Stojkovic, Marko Maletin, Jovan Popovic, Milenko Milosevic, Rasko Dimitrijevic, Stanislav Bajic, Nikola and Kosta Milutinovic, Slavko Borojevic, Zivan Milisavac, Dusan Popov, Vasilije Jovanovic, Bosko Petrovic, Berislav M. Beric and Bozidar Timotijevic. The donation of Nicole and Sreten Maric (13,000 books) has been arriving to our library since 1989. The Matica Srpska Library also has in its possession the library of the Serbian Orthodox Great High School of Novi Sad (founded in 1819) which includes 12,000 books, the collection of books belonging to the Serbian United Youth, as well as the valuable library of the Sterijino Pozorje - Yugoslav Theatre Festival which includes books on history, the theory of theatre and drama literature. Donated Library of Austria has been stored in the Matica Srpska Library since 1998, containing now over 4.000 books and periodicals. It is completed continously with new publications. Old and rare books and legacies have been processed to the Department of Old and Rare Books and Legacies. Since 1992, when the computer cataloguing of rare books began, it has been made possible to search for them in an electronic catalogue, as well as in the existing classical card catalogue. The computerized library system enables the technical preparation of the rare book catalogues for printing. Publishing of these catalogues is now more intense.